Slice the onions, cucumber, tomatoes, chillies and coriander extremely finely and mix together in a large bowl. Add lemon juice to taste, you want the taste to be nice and zingy.... no subtle flavours here. Add a teaspoon of sugar, and salt to taste. Leave aside for 30 minutes or so in the fridge for the flavours to mingle. Serve with any Indian meal, and it's also a delicious side for any barbecued or grilled meat. Cooking perfect rice is one of the essential skills in Indian home cooking. And the secret to this art? Buy the right rice and you're halfway there. I would never recommend buying rice from the supermarket, you need to get yourself to an Indian grocery shop and find the best Basmati you can. Look for aged Basmati rice, beautiful long fragrant grains which will cook separately (Indian rice should never be soft and mushy). You can even buy Sela Basmati, which is parboiled before milling to preserve its nutrients, and cooks even faster. Most Pakistani Basmati is good, a couple of the brands I buy include Dawaat, Lal Qila and Kohinoor. The rice comes in big five kilo bags, but it will last for ages. The next trick is soaking the rice before you cook it. Always wash it well, and then leave it to rest in the water you are going to cook it in for at least 15 minutes, though half an hour is better. In terms of the ratio of rice to water, I use 1:2 - a cup of rice (usually enough for four people) and 2 cups of water. You want the water level to be about an inch higher than the level of the rice in the pan. To cook the rice, turn your heat to high and bring it to a boil. As soon as it boils, turn the heat down to very low, partially cover with a lid and cook for 10-12 minutes until all the water has evaporated, then turn the heat off. Put the lid on fully and leave the rice to keep cooking in its own steam for another 10 minutes, if you have an electric stove just keep it on the warm hob. Always fluff the rice up before serving, you can drizzle in some olive oil or a spoon of butter or ghee. There are infinite variations for flavouring rice as you cook it, and I have included a few below. All quantities are based on a one cup serve of rice. If you are cooking more than a cup, you probably want to increase the amounts by one and a half. Add a teaspoon of salt and a teaspoon of olive oil to the cooking water.... include this in all variations below. Add a teaspoon of cumin seeds along with the salt and oil. Add half a teaspoon of turmeric along with the salt and oil, with or without cumin seeds as well. Whole garam masala adds a beautiful fragrance to your rice. Add a bay leaf, 3-4 cloves, 2-3 cardamom, a few peppercorns and a stick of cinnamon. You can also fry these in a bit of oil first, then add the raw rice and water, but simply adding them to the water is fine. You can also include half a teaspoon of cumin seeds, and half a teaspoon of turmeric. Another easy variation is to change the cooking liquid. Instead of water, you can use stock (homemade chicken stock is amazing with all the whole spices), or even coconut milk. Another option is to add a quartered tomato, or include some tomato passata in the liquid. Throwing in some frozen peas as the rice cooks is also nice. All sorts of garnishes work well on rice, especially if you have made a lovely yellow pea pilau, or a fragrant rice with stock. Chopped herbs, coriander, spring onions or mint, or a bit of red chilli for colour are perfect. Deep fried shallots or onions give a lovely crunchy texture, and this also pairs well with sliced hard boiled eggs. 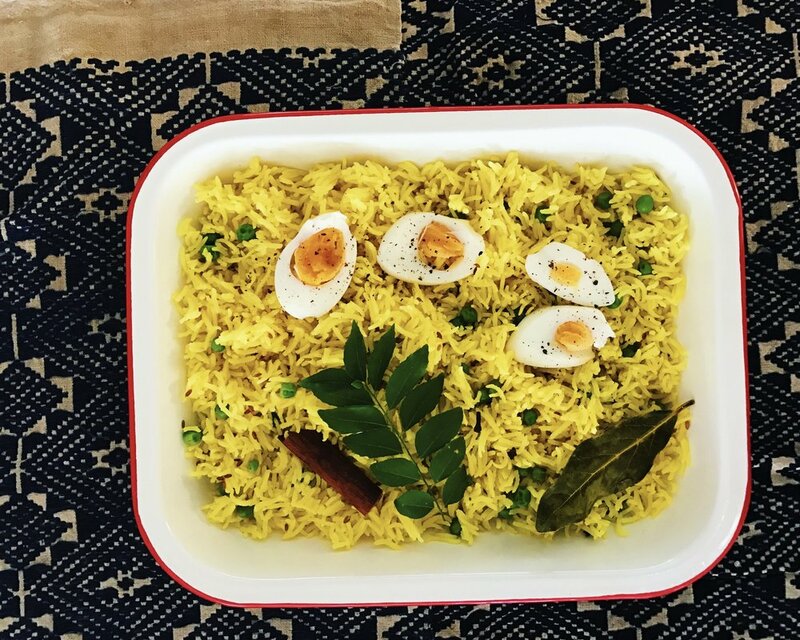 There are so many more delicious ways to cook rice, lovely pilaus with lots of veggies, khichri, which is rice cooked with lentils, and lots of rice variaties to use, like brown and red rice. I'll be posting some of these more complex recipes separately this year, so stay tuned.